Very early on and already both players have caused some damage to each other’s blocks. Towards the end of the game, blocks are full of collapse markers and fires. I hadn’t played Block Mania for over 25 years and decided to give it another try this week. If you’re not aware of it, it was a game made by Games Workshop (back in the days when they did more than just their own licences) set in the world of Judge Dredd (from the 2000AD comics). The ultra-large high-rises (blocks) of Mega-City 1 sometimes start fighting with their neighbouring blocks for good or bad reasons (or, sometimes, for no reason at all). When I played it when released in 1987, I found it was a great idea but just didn’t deliver the massive action it should have done. 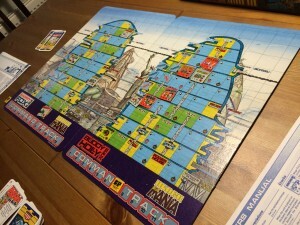 It seemed there were too few units on the board (because they were easily killed but not easily added). The reason for this is that each player would get 2-12 (2d6) action points (APs) to spend on their turn. This made the game very swingy, especially if one player rolled low and the other high. After playing Euphoria last week with 5 players, a couple of us wanted to try it with 2 players. The game is mostly the same with just 2 differences: it takes only 2 actions to build a market (not 4 when played with 5 players), and there are only 2 spaces where stars can be placed in each territory (not 5 as with 5 players). 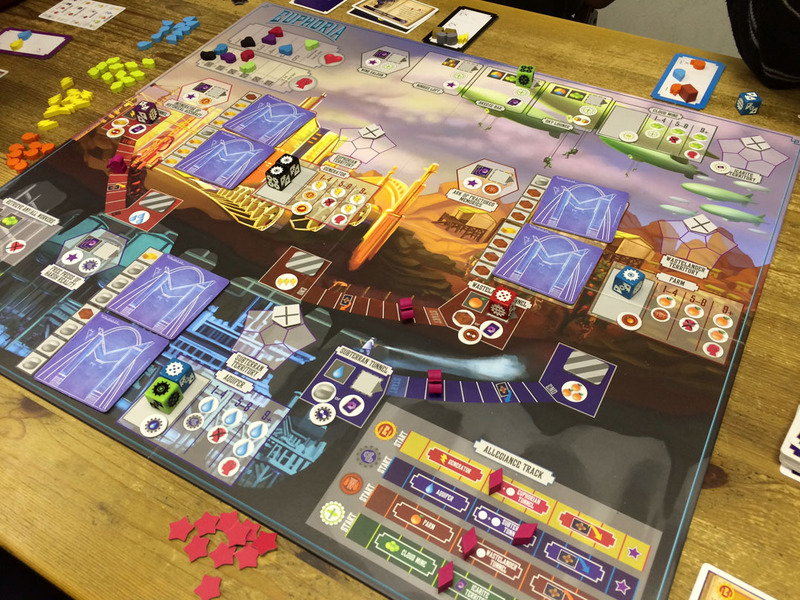 As before, I enjoyed playing Euphoria – the theme works really well with the game mechanics and working out how to use workers and resources is entertaining. It worked fine with 2 players, although I think it’s more fun with more players as there’s more chance of your workers being bounced back to you, more chance of higher totals to earn commodities, and more development of the allegiance tracks and mines which make a big difference. I think most of the issues could be solved with a few more rules for scaling the game, such as making the tracks shorter. I’ll post more thoughts about this soon. Euphoria worked well enough with 2 players – I would prefer to play it with more but, with the current rules, I think 3 players would be fine and 4+ would be best. It had been a long time since I last played Tzolk’in and it definitely showed as I tried to recall my previous games so I could create a decent flow of resources to then convert into points. Tzolk’in is definitely a tricky game to balance which makes it a good challenge. There are several ways to score points and I think you definitely need to choose to pursue just one or two of these in order to do well. 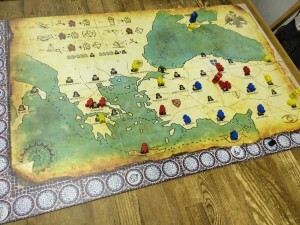 Tzolk’in works well with 2 players. 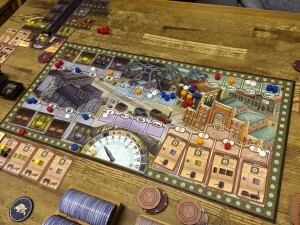 Each 2-player game can be a little different as neutral workers block some of the locations on the wheels (determined by randomly drawn cards at the start of the game). 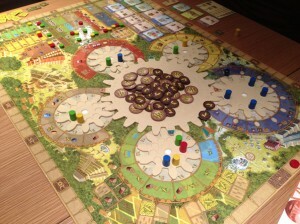 I think the 2-player game may be slightly more forgiving as turn order can be quite brutal with more players because the last player in turn order can find the wheels packed with workers – whilst that means they could place their workers further around a wheel, it requires lots of corn. 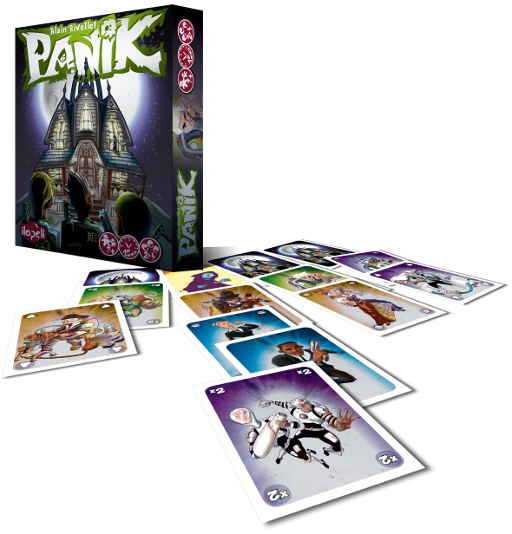 Panik is a very quick, light game with some bluffing. Players place their ghost hunters in front of mansions in order to score points equal to the mansion’s value; however, each player only knows what a few of the mansions are worth (and each player knows about different mansions). Placing a ghost hunter can expel one already placed there to a different mansion (chosen by the expelled card’s owner) so there’s some jostling during the game. Various ghost hunters have special effects too. With limited information on which to base to your decisions, the fun is from trying to read into what your opponent(s) have done. However, that also means you need to work out if they’re trying to mislead you, and work out how you can mislead them too. Panik worked quite well with 2 players (taking only 5-10 minutes for a game); however, I think it’s better with more. The mind games and displacing other ghost hunters mean there’s more to it than it first appears, but there may not be too much more to discover after some replay. Can work as a gamers’ filler game, but more for a lighter audience. Played with 2 and 4.